Need last minute holiday gifts? 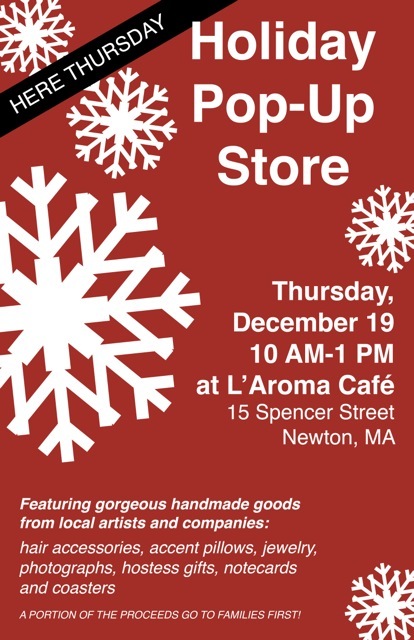 Come to a Holiday Pop Up Store at L’Aroma Cafe tomorrow, Thursday, December 19th from 10 am to 1pm. L’Aroma Cafe is located behind the West Newton Cinema at 15 Spencer Street in West Newton Village. You will find local artists and artisans with gorgeous wares including hair accessories, accent pillows, jewelry, photographs, hostess gifts, notecards and coasters. Get your morning coffee, a muffin or lunch and get a little holiday shopping done as well! A portion of sales will be donated to Families First.